Are there speed limits in the sky? How fast can aircraft fly below 10,000ft and at high altitudes? Can a civilian plane fly supersonic? 250 knots? Where? When? Why? 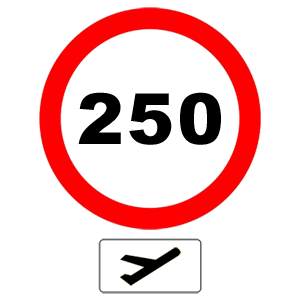 250 knots indicated air speed (KIAS) is a well known speed restriction under 10,000ft. Make sure you are aware that this is not an universal rule around the world! It’s common, but there are exceptions. When 250 knots is a limit? Let’s start with basic ICAO rules – so Europe, Asia, Africa… almost every country with the exception of USA and Canada. 250 KIAS – below 10,000 ft in class F and G uncontrolled airspace. If “class C” confuses you – read my recent post about Airspace classification. Why there are such differences? Remember my post about airspace? In class B airspace separation is provided for all aircraft (even VFRs). In such a strictly controlled airspace even VFR aircraft can fly at high speeds with no risk of collision. In class C airspace VFRs are not separated – so their speed is restricted. In D class airspace IFR planes are not separated from VFRs. So all flights get a speed limit. And so on – no separation between IFR and VFR planes in E class airspace (ATC may not even be aware of a VFR flight in this airspace) – speed limit for everyone. The same applies to uncontrolled airspace. I wrote “no speed restriction”. Can a plane fly supersonic? It depends… There is no general or universally adopted rule against supersonic flights. In each country these are governed by appropriate regulations. In some cases it may be difficult to find whether supersonic flights are allowed or not and what other restrictions apply. I made an observations – the strictest rules were imposed in countries where an individual or a company can actually afford supersonic flight. There are almost no limits in countries where a private supersonic flight is unlikely. For example in Poland there is only a restriction against flying supersonic at night and below FL340 (34,000ft). Should someone fly his private F-4 Phantom II over Poland – he can do it with supersonic speeds above FL340 and during the day… Additionally this pilot should avoid certain areas over large cities and places like explosives factories (sonic booms should be avoided here). But this is just a theory. I heard nothing about private jets flying supersonic above Poland. In countries where the supersonic flights could be a real problem the rules are strict and ban all such flights over land or specify supersonic routes and areas where speed restriction is lifted. There may be separate rules for military and civilian aircraft. Also – rules for the military may depend on the mission with restrictions applicable to ferry or training flights and lifted for tactical sorties. IFR procedures like approaches, arrivals and departures can set additional speed restrictions forcing aircraft to slow down or to keep high speed where specified. ATC may always lift this restrictions. They are applicable only if the safety of aircraft is not threatened. Aircraft that can not fly as slow as required by procedure should fly at lowest safe speed. There is an additional restriction for VFR flights in low visibility – such flights (both VFR in uncontrolled airspace and Special VFR in controlled airspace) should be performed at speed that allows to observe and avoid traffic and obstacles. It must not be higher then 140 knots (IAS). 250 knots below 10,000 ft applies VFR and IFR traffic in all airspace classes below 10,000ft. [U.S.] 200 knots – VFR flights below class B airspace and in transit corridors through class B airspace. [U.S.] 200 knots – below and at 2,500ft in a distance of 4 miles (or less) from an airport in class C and D airspace. ATC may lift this speed limit. There is no such limit in class B airspace. [Canada] 200 knots – below and at 3,000ft, in a distance of 10 miles or less around controlled airport (ATC may lift this limit). There are two reasons for imposing 250kn limits below 10,000ft. Bird strike risk and traffic avoidance. It’s hard to observe and avoid a plane that flies 300kn when you are flying at similar speed (it can be argued that it’s also difficult when both aircraft are flying 200kn…). So why no limit above 10,000ft? Just as in case of birds – there are fewer planes above this altitude and the risk of collision is much smaller. Also – planes that fly above 10,000ft are often equipped with TCAS and should be visible on radar to the ATC. General restrictions are usually described in the AIP. Supersonic flight restrictions may be defined in other regulations. Local and procedural speed limits are shown on charts and in procedure descriptions.